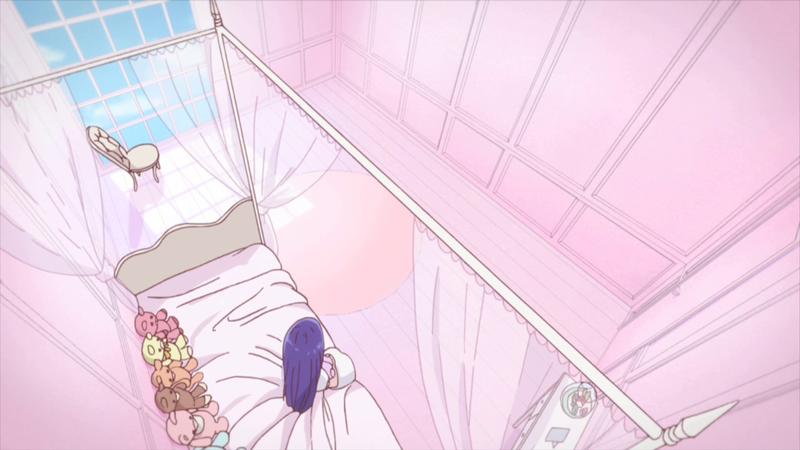 Flip Flappers: Episode t-ime to talk about Kiyotaka Oshiyama, actually. Goodbye fun weekly adventures, you were delightful while you lasted. The actual plot and overt narrative are taking the focus now, which means explanations, revelations, twists and turns that had to happen at some point. 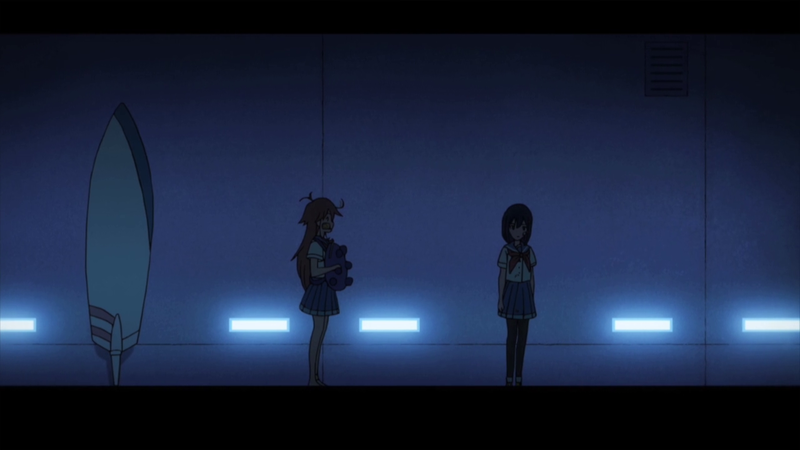 In a way, it was a standard exposition episode – as standard as a show like Flip Flappers can be anyway. I don’t think there was anything outstanding about the way the story was told and the same could be said about the visuals, which were up to the series’ high standards minus the explosive animation highlights often accompanying them. With that in mind, and considering every new reveal simply opened the doors to future developments, what’s there to be said about this episode other than running down the plot reveals which all of you who’ve seen the episode know already? Let’s talk about series director Kiyotaka Oshiyama, who deserves lots of praise for what he’s done. As a top animator, his relationship with the series hasn’t quite been what’s expected from a director. Since the very beginning, it has been a well-known fact that Oshiyama himself came up with the ideas and rough designs for the inventive settings, environments and even objects populating them. He’s been doing key animation regularly (episodes 1, 4, 5 and 7), which is quite rare to this extent and requires additional time in the director’s already packed schedule. For episode 1, he did layouts for circa 100 cuts (quite a lot if you can’t tell!) which were then animated by character designer Takashi Kojima. Let’s not forget that he also animated the ending all by himself too, without even requiring inbetweeners. Usually, when a director decides to do key animation in his own show, it’s for the series’ most important episodes. A good and recent – though unconfirmed – example would be Susumu Mitsunaka’s breathtaking rotation in Haikyu Season 3′s finale. These are exceptions to begin with of course, and they can get pretty extreme. For example director Masaki Tachibana, with help of many clean-up assistants, solo key animated the entire final episode of his show Barakamon! But back to Oshiyama. Reports from an event also revealed that he tends to not get credited for all of his drawings, contrary to the character designer and chief animation director Takashi Kojima, who gets listen even for 2nd key animation and in-betweens. That means Oshiyama probably did even more stuff that we likely won’t find out about unless it’s specifically mentioned. If we look at the more regular directional duties, he storyboarded episodes 1, 2, 7 and this one. 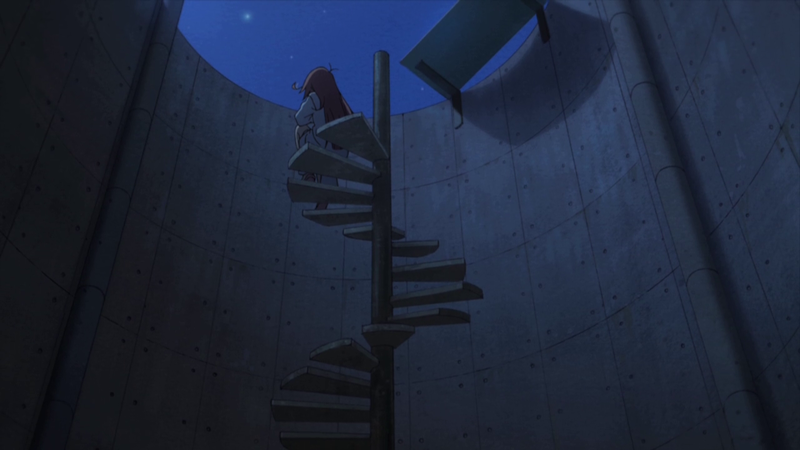 His storyboards make excellent use of the settings that he himself created, as this episode once again proved; some of my favourite shots this time around displaying these fascinating designs include the very first cut of Papika sitting on spiral stairs, Mimi’s lonesome room and Papika(na)’s bizarre dwelling. 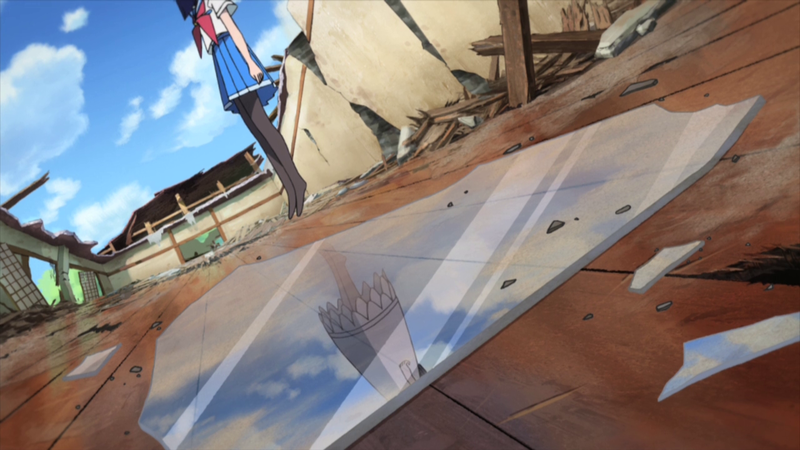 Oshiyama clearly likes experimenting with angles and reflections, as shown in this cut that’s clearly using the same motif present in the opening sequence. It’s a bit of shame that Studio Pablo left the production, because while Inspired’s work at developing Oshiyama’s concepts is satisfying, it doesn’t quite live up to what the show had before. 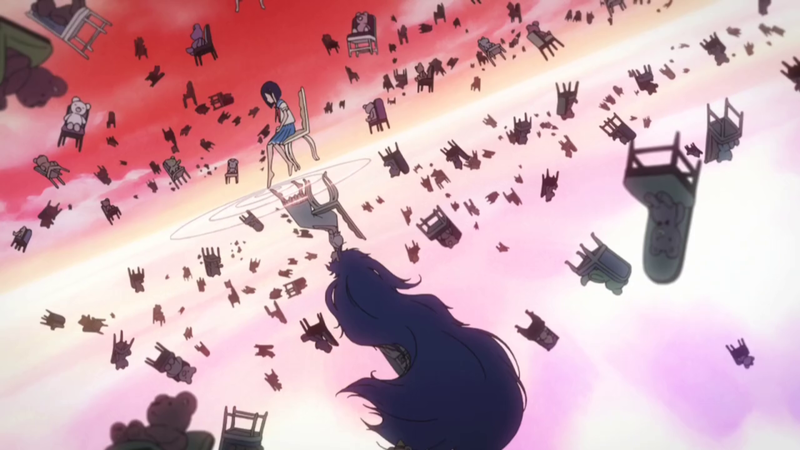 The piece of animation that caught my attention in this episode was this weird morphing sequence of Cocona’s fake grandmother, not only because it’s a striking scene but because it relates to what I was talking about. 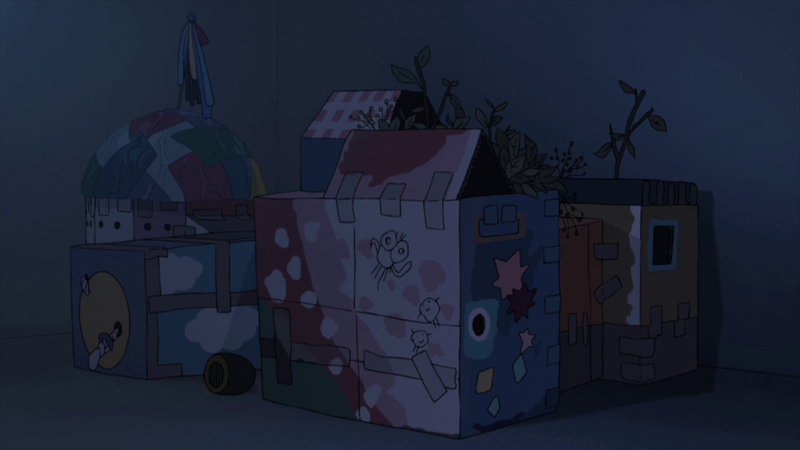 The blobby shapes are very much like Oshiyama’s own and it really reminds me of his work from Doraemon‘s 2008 movie. Maybe we’ve got our hands on one of his uncredited works after all! I’ve derailed this post a bit but I think it’s worth to appreciate the director’s work on this show. He really deserves it! Is it true that Sakuga Blog is collaborating with Anime Feminist for the “Women in Sakuga Programme”? They want more women to write about sakuga related matters, which is a nice idea as far as we’re concerned so we’ll be helping out newcomers… just like we’d help anyone in that situation who approached us, so it’s not really anything new for us.